I have a few of these so I thought I’d capture here what I have learned about them over the years. These were produced in the period between the Invasion of Poland in September 1939 and the Battle of Bardia in January 1941. Although widely imitated, the originals were made by the Fieldings company (also manufacturing Crown Lynn) in Staffordshire. Most of the ones you’ll see are in the shape of miniature “po’s” although printing on the side of the pot will invite you to use it as an ashtray. The first target of mockery was Adolf Hitler. Later one mocking Herman Goering was produced. The caricatures inside the pot were the work of the prominent British cartoonist, David Low. 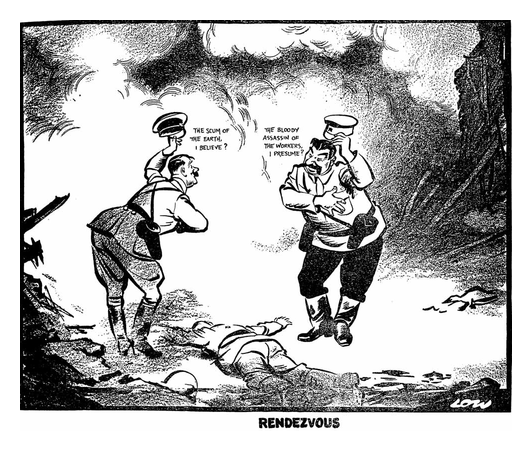 The final instance uses Mussolini as it’s target and you can see that it is a different artist who did the cartoon inside. At this time the Fieldings factory was fortunate to have the brilliant designer Enoch Boulton as it’s Chief Designer. Boulton was well known for his sense of humour and it was his support that had these produced. They were always seen as bad taste and cheeky but the public gobbled them up anyway. 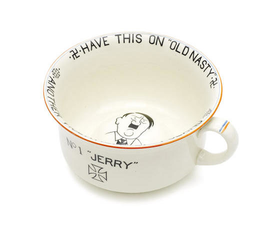 The slang term for a chamber pot at this time was a “jerry” so there is a double entendre in the wording used here. There were a number of imitators who manufactured similar items to cash in on the market. I have a few of these but all of them are of a poorer quality both in materials and artwork. The holy grail of these items is a large one made by Fieldings which had a music box fitted to the bottom and played “Rule Britannia” when it was lifted from it’s wooden base. I include a couple of pics below but since they go for in excess of $5000 I expect that will be as close as I ever get. As the war ground on it became clear that this was not going to be a short fight and the public mood changed. These items became less popular and Fieldings ceased making them shortly after the Mussolini one. I also have the actual ashtray one in my accumulation. This one is much tougher to find than the little chamber pots. I have heard one mention of a Goebbels pot in a Crown Devon catalogue, never seen one though so it may be ethereal/ephemeral. Boulton later became Director of Fieldings in 1949.